This is my favorite salsa, I remember the first time we made it last winter thinking it was the simplest, tastiest salsa I've ever had. And the best part is that it only requires 5 ingredients, most of which you probably have laying around, and takes no time to make. I'm a such a sucker for that spicy complex chipotle flavor that really makes this salsa what it is. Combine all ingredients in a blender or food processor and pulse until desired level of chunkiness is achieved. Adjust to taste. The first time I had homemade chai tea was at a yoga retreat years ago. It was made in a giant batch by a vegan, Ayurvedic chef and it was like nothing I had ever tasted. Sweet, spicy, warm, and creamy with notes and layers I don't even know how to describe all happening at the same time. I remember asking the chef how she made it as I gathered up my yoga props from the day's practice. She said she'd developed the recipe over the years and then listed off a dozen spices. I remember seeing whole spices at the bottom of the giant pot as I ladled myself cup after cup. It was incredible. I've never been a coffee drinker, I'm convinced my husband and I are the last two people on earth who don't drink caffeine. So after I discovered chai I started ordering it at places like Starbucks and Argo tea. And let me tell you, it's been a story of disappointment after disappointment. I'm no expert, but these drinks don't even deserve to be called the same name as the stuff I had that day of the retreat. And from what I've read the main difference is that these places all use store-bought chai concentrate. Booo. So I sought out to try and re-create that yoga retreat chai, whole spices and all. I researched all over the internet. I consulted Indian and Ayurvedic cookbooks. I experimented with different spices and different steep times. Different sweeteners and proportions. And I kept failing. Until now. I don't know if this stuff is the real deal, and like I said, I'm definitely no expert, but this stuff tastes spot on to that magical drink I had two years ago. It's well-worth the two hour steep time, and makes a bulk portion of the best chai tea I've ever had. A warm mug of it is helping me get through winter in Chicago, but I'd imagine it would be just as good served over ice in the summer. Notes: None of the spices were too hard to find. If you have a local Indian grocery store I recommend buying them in bulk from there. If you're in Chicago, I'm a huge fan of Patel Brothers on Devon (while you're there stock up on things like lentils, basmati rice, and rose water). I also ADORE The Spice House in Old Town, they have any spice you could ever possibly need and I don't know what I'd do without them! Last resort, check out Amazon! Most recipes call for the finished chai to be topped with honey or agave but I found that the licorice added just enough sweetness for me. Feel free to add some in for extra sweetness. In a large pot combine the water and all of the spices, leaving out only the black tea and coconut milk. Bring water with the spices to a boil, then reduce to a simmer. Cover and simmer for 2 hours. For a caffeine-free version (this is what I did) omit the black tea. If using black tea, add it to the pot after the 2 hour steep time and let it steep however long the package instructs (usually about 10 minutes). Remove the tea bags and turn off the heat. Pour in the coconut milk and stir until combined and warmed throughout. You can serve immediately, as the spices tend to sink to the bottom. To store the remaining tea (it's good for about a week), pour it through a fine mesh strainer and discard the spices. I stored in mason jars. While re-heating, make sure the tea does not reach boiling point as this causes the coconut milk to separate. These are my favorite christmas cinnamon rolls adapted for summer. We made rhubarb compound butter last week and now I'm putting it to good use! The light coconut cream frosting and strawberry rhubarb filling makes these buns perfect for early summer! Notes: Dough can be made ahead of time. Let it rise fully (2 hours, plus 20 minutes) then cover and refrigerate up to about 3 days. The rhubarb butter and frosting can also be made up to 3 days in advance. In the bowl of a stand mixer proof the yeast with 1/2 teaspoon of sugar and 1/4 cup of warmed water. Set aside, after about 5 minutes the yeast should look puffy and bloomed. In a medium bowl, mix together both flours, remaining 2 tablespoons of sugar, and salt. Set aside. In a small bowl mix together the melted butter, egg and vanilla. Add 3/4 cup of water and the butter mixture to the yeast mixture and stir to combine. Then with the stand mixer on low slowly add the flour mixture until the dough because integrated and sticks to the sides of the bowl. Remove the dough from the bowl, with heavily floured hands knead it into a ball then place in a well oiled bowl in a warm area, covered for two hours. Meanwhile, prepare the rhubarb butter and lemon coconut frosting if you haven't already. After two hours, punch the dough down then let sit for 20 additional minutes. Prepare the filling by tossing all of the ingredients together in a small bowl. 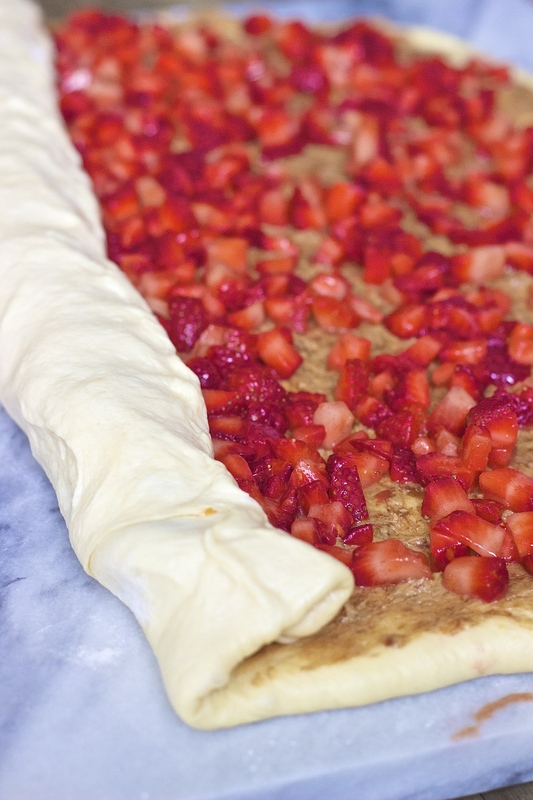 On a well floured work space roll the dough out into a large rectangle (about 14 X 18 inches). Carefully spread on the rhubarb butter. 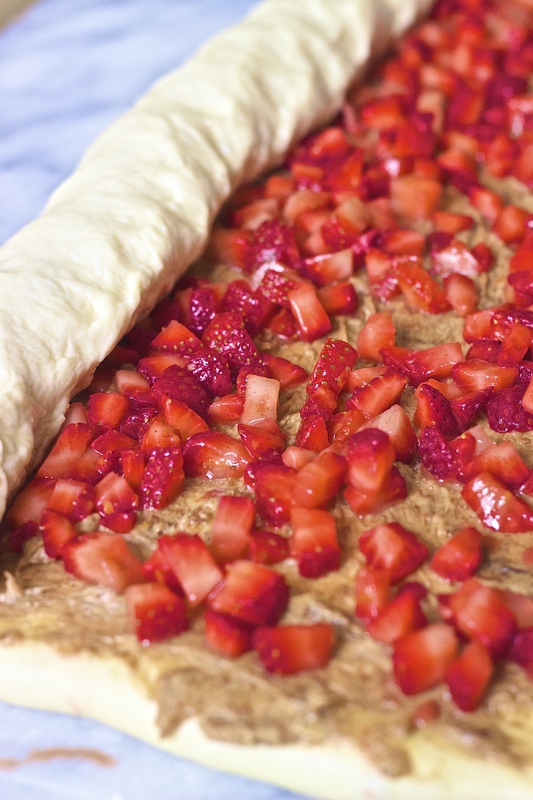 Drain any liquid from the strawberry mixture then top the rhubarb butter with strawberries. Starting from the long end begin to roll the dough up into a tube. Carefully cut the tube into 15-16 equally thick rolls and place cut side down in an oiled 8x13 inch baking dish (I ran out of space and placed the last one in a ramekin). Let sit for 20 minutes. Meanwhile, preheat the oven to 400. Position one rack in the middle the second rack on the lowest rung. Fill a baking dish with water and place it on the low rack. Place the cinnamon rolls on the rack above and cook for 25 - 35 minutes until lightly browned and a skewer comes out clean. Top with frosting and enjoy!